The Dirty Dozen meets Band of Brothers in this true story of how a rusty old New Orleans banana boat staffed with an unlikely crew of international merchant seamen, a gang of inmates from a local jail, and a French harbor pilot spirited out of Morocco by O.S.S. agents in the trunk of a Chevy, were drafted into service in WWII -- and heroically succeeded in setting the stage for Patton's epic invasion of North Africa. 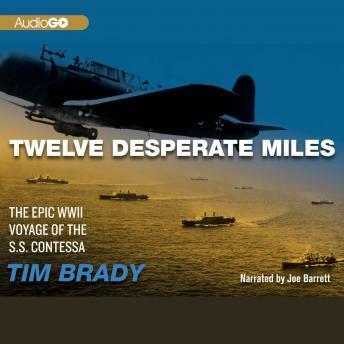 While portraying the ship's journey day-by-day and describing its colorful crew, Twelve Desperate Miles chronicles the overall November 1942 invasion of Axis forces and its aftermath, as well as the critical but unsung role played by the Contessa.